Watershed Farm is very excited about expanding its collaboration with and support of The Ark in Bridgewater. For many years The Ark has been fulfilling its mission in providing programs for adults with special challenges and those needing support by creating an environment that fosters happiness through increased wellness and ever more fully realized citizenship in the larger community. 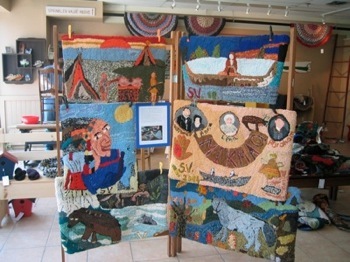 At present The Ark has over 70 participants many of whom are involved in the creation of beautiful hooked and braided rugs, woodworking, the caning of chairs, and various other useful and creative endeavours. The Cooking Program at The Ark helps the participants learn important skills including the planning of menus, shopping and budgeting, learning to follow recipes, food preparation and cleaning and finally the serving and enjoyment of the meal itself. By contributing to the Cooking Program with a regular donation of food, Watershed Farm is acting from its belief that "a healthy social life exists where, in the mirror of each soul the whole community finds its reflection, and when in the whole community the virtue of each one is living". This year we hope to also be able to offer therapeutic gardening opportunities to some of the participants of The Ark who will pay visits to the farm and help tend or harvest some of the crops according to their ability. Here's the lovely speech that was written by two women who participate in the Cooking Program and was read at the recent Christmas Turkey Dinner where Watershed Farm was presented with a beautiful plaque as a Community Partner Appreciation Award. "For the past three years Watershed Farm has donated a fabulous variety of organic vegetables, fruit and herbs to The Ark and the Cooking Program. These donations have been delivered with a smiling face each week, sometimes even twice a week, during the growing season. And we sure have enjoyed them. 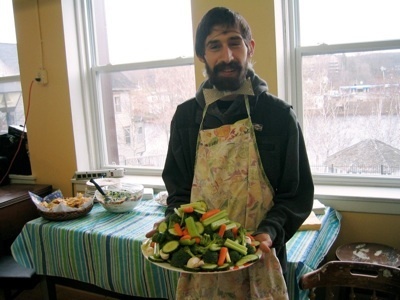 The Cooking Program has created all kinds of interesting meals, and clients have tasted veggies like edmame beans, multi-coloured carrots and kale for the first time in their lives. Many clients have also taken veggies home to prepare themselves, making meals like stir-fry and curry. Even the pets got to enjoy the food with the carrot greens going home to my hamster. We are very pleased and grateful to be able to present this Community Partner Appreciation Award to you, Camelia Frieberg and your wonderful Watershed Farm. Thank you from all of us and we wish you a good growing season for the new year coming." 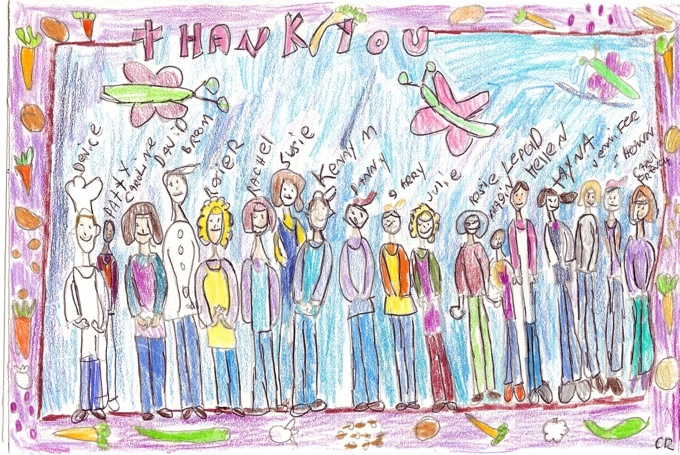 This picture is a drawing of all of the chefs who participated in the Cooking Program this year. It was very rewarding for us to know that our food was so well appreciated. Some of the chefs even visited us at the Lunenburg Farmer's Market.